Carol was always the first to greet visitors to Gothic Lodge, her home in London’s L’Arche community for over thirty years. surprising that the church was packed for Carol’s funeral recently, and many others sending greetings from all corners of the world. L’Arche is an international federation, and its bonds of friendship stretch far and wide. Friendship was a central theme of Carol’s funeral, and in the sermon I reflected on the ways in which Carol enabled us to enter into the gospel of friendship. The gospel reading was the passage from Mark (Mark 2.1-12) where a group of friends carry a paralysed man to Jesus and, unable to get him into the room where Jesus is, they lower their friend through the roof. It is friendship that brings the man to Jesus to be healed, and it is through friendship that we too come to Jesus. The most obvious interpretation of the passage is that without his friends the paralysed man would not have been able to be brought to Jesus: Carol also relied on others to bring her to church, latterly in a wheelchair; over the years Carol was brought to church by dozens of different assistants. The deeper truth in the gospel is that the person with the disability brings his friends to Jesus; without them carrying him, would they be there at all? 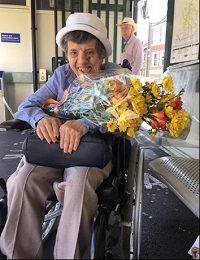 The need of the paralysed man brought his friends into the centre of the room, and to the feet of Jesus; and so Carol, in her need for the assistance of friends, brought them to Jesus, gathering them into the heart of his community of friends. At the end of the passage, Jesus invites the man to ‘stand up and go home’: we focus on the first part – the miracle of the paralysed man standing; but the deeper transformation is the invitation to be ‘at home’ – to be in the place of friendship and belonging. And so, at the end of my sermon I reflected on the way in which Carol had not only brought people to Jesus, but in fact had been Jesus to others; Carol, like Jesus, and through her friendship, enabled others to ‘come home’, most especially to come home to themselves in a community of friendship. Theologian John Swinton, who has worked as a theological consultant to L’Arche, speaks about friendship as not just knowing another’s person’s story, but that person becoming part of your story. All who gathered at Carol’s funeral were united in the friendship she’d shared with each and all of us – she is part of who we are, part of our story of being named and known in friendship, faith and belonging.